Head on over to the new davecenker.com, sign up to be a member of my author community, receive a free award-winning short story and continue the conversation! See you there! One thousand days ago (hey, it just sounds better than 2 years, 8 months, and 26 days) I remember sitting down with a guitar resting on my knee. Those malformed chords I was strumming were messy sounding, but the chord it struck inside me was perfectly in tune. I remember thinking … I should start a blog. It came out of the blue, and I wasn’t sure why I vocalized that thought. I had written less than a total of 500 creative words up to that point in my life. If someone would have told me way back then that I would be composing this post today, I would have surely let out an involuntary chuckle beneath my breath. It’s not that I wouldn’t have wanted to be here, but I have this way of starting different things (lots of them) only to have them collect metaphorical dust as the initial excitement fizzles out along with my passion for it. And yet, a thousand days and just a few more than five hundred words later, I compose this post with an anxious yet excited heartbeat. This will be my last post at this blog site. That’s the sad part, for me at least. This little corner of the blogosphere has been a sort of virtual private sanctuary for me to discover and share insights, thoughts, and stories with each and every one of you. The exciting news – again, for me at least, and hopefully for you too – is that my writing will continue forward with as much, if not more passion than I have had up until this point. Today, I am launching my new author-centric website at www.davecenker.com. For those of you that have been following along with me on this journey over the past three years, you will know my tagline by heart – inspire and be inspired. I’ve written personal essays, flash fiction, short stories, and even a novella up until this point. During NaNoWriMo (National Novel Writing Month) this past November, I set an ambitious goal to write my first novel, uncertain where that lofty ambition would land me. 50,000+ words and several personal revisions later, I have a draft of my first novel, Second Chance, that I am now ready to pass over to my editor. My plan is to have it published sometime later this year. In an effort to build an author platform, I have migrated my online presence to www.davecenker.com. Along with promotion and news on the release of my first novel, I will be offering flash fiction, short stories, book reviews, and the occasional dip into non-fiction. I have a feeling that pressing the publish button on this post is going to be more difficult than any I have pressed up until this point in my writing life. But, if you’re reading this, I suppose that I’ve been successful in overcoming that small hurdle. I want to sincerely thank each and every one of you for all the reads, the likes, and most importantly, the comments that have helped me to embrace this role as an author. I know it sounds so cliché, but truer words could not be spoken – I simply couldn’t have done it without you. I invite each one of you to visit my new site and continue onward with me on this journey we have started together. As a small token of my appreciation, when you sign up to be a member of my author community, I will send you a copy of a previously unreleased short story titled Homecoming. I would be honored to share this story with you that has received an honorable mention in the 2015 Writer’s Digest Popular Fiction Contest. 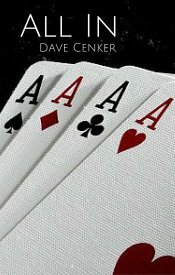 You can join my author community by visiting my new site at www.davecenker.com and clicking the Free Story! link in the top right corner of the home page. I’ll still be checking this site for the next couple of weeks, so if you have any problems or questions, feel free to leave a comment here. Let the magic of new beginnings be with each and every one of you. Inspire and be inspired. Ray looked across the table. Shuffling the deck of cards, his eyes remained locked on mine. I knew his plea wasn’t referring to another hand of poker. That’s the way it was with Ray and I. We knew what the other was thinking without saying a thing. A slight nod signaled my consent. When at an impasse, everyone else in the world turned to a quick game of rock/paper/scissors. For Ray and me, it was poker. Five cards were dealt to each of us. Fanning my cards out, the full house with aces high left me confident that I wouldn’t be subjected to Ray’s proposal. Setting my cards face up on the table, Ray’s initial facial expression left no hint as to the outcome of our duel. The emerging smirk on his face along with the royal flush that followed suit secured my fate. “Last time,” Ray assured me. “This one will be a breeze. The super only wants a ten percent cut in exchange for the master key.” Ray slid the brass key across the table to me. It’d become an addiction, pilfering the apartments for small items that owners wouldn’t miss, but could be pawned for some decent cash. Ray used his position as general contractor to scout out potential targets. I’d sweep in later and snag the goods when the owner was not at home. I was done with the entire thing. I’d be marrying Julie in two weeks. She’d changed me for the better. I’d always be grateful, even if I couldn’t thank her for it. I couldn’t expose that negative side of my being to my future wife. Later that afternoon, my phone rang. It was that short. Like I said, we could easily complete each other’s thoughts. I slipped through the hallway inconspicuously. Glancing left, then right, I slipped the master key into the lock. Easing myself into the apartment, I quickly moved towards the kitchen. The high end utility knife was our most ambitious target to date. Its absence would be noticed. Since this was the last time, however, it was well worth the risk. It would pocket us nearly two Ben Franklins. It wasn’t where Ray said it was supposed to be. Something wasn’t right. It was against our code, but I had no choice but to call Ray. “Where are you exactly?” The tone in Ray’s voice was disconcerting. Julie agonized over the decision. She wasn’t proud that her brother was a recovering drug addict. But, he was making amends and getting his life back on track. Julie was happy to watch James’ golden lab while he was helping at the halfway house for the week. She knew that Sean, her future husband, deserved to know the truth. She’d tell him everything this evening over dinner. The envelope on the counter was addressed to James Reilly. Same last name as Julie. The picture resting beside the envelope confirmed my anxious suspicion. As the rightful key unlocked the apartment door, a realization of the circumstances about to unfold paralyzed me. In poker parlance, I knew I was all in. My cards were on the table, and I had no choice now but to play them. I’d have that opportunity to thank Julie for all she’d done for me. Whether she’d believe me, or even be willing to listen, was a different matter altogether. Author Note: Thanks, as always, for taking the time to read and comment. It’s in the sharing each other’s stories and thoughts that we become something more than the sum of the parts. The transition to my new author website is progressing and scheduled for going live in a couple weeks. To make sure you stay connected and continue to receive these (#FlashFictionFriday) stories to your inbox, please sign up to be a part of my author community. You will receive two previously unpublished stories as a small token of my appreciation (one now and another one once the new site goes live). As always, inspire and be inspired! Author’s Note: Exciting changes are coming to my blog over the next month or so! I am in the process of converting my offering here in the blogosphere over to a complete author website in preparation for my first full-length novel release later this year (Second Chance). To make sure you remain connected with me through this transition, I invite each of you to subscribe to my author email list. I promise not to spam you, and you always have the option of unsubscribing at any time. I would be honored and privileged to have each one of you follow along and share with me as I continue onward and take the next step towards becoming a published author. As a small token of appreciation for your active participation in my community, I am offering you a copy of a previously unpublished short story, Impression, upon joining. Also, once I complete the transition to my new website, I will be offering new and current email subscribers another unpublished short story, Homecoming, that was selected as an honorable mention in the romance category of the Writer’s Digest 2015 Popular Fiction Award Contest. I’m both anxious and excited (but, more excited) about continuing this journey towards sharing my love of words and the emotions behind them with each and every one of you. As always, stay inspired … And now, on to this week’s flash fiction offering – a bit of tongue in cheek humor to kick off the new year. A package of bacon, a jar of pickles, and a half gallon of milk. Paul put a checkmark next to each item on his list. It was an odd assortment of items to place on the conveyor belt, but it’s what his mother had written down. He’d come home too many times with the wrong thing to not follow her list to the letter. Everyone seemed to need milk today. Paul had gotten the last container. Listening to the beeps of the scanner complete his order, Paul dug the cash out of his pocket, handed it to the cashier, and waited for his change. Knowing his mom would ration his intake of milk, Paul opened the jug and took a quick sip. Grabbing the reusable bag filled with his purchases, he exited the comfortable air conditioned store, emerging into the sweltering heat of the summer evening. That’s odd, thought Paul. He heard the trill of a bicycle bell, the kind he last heard as a toddler on his tricycle. As Paul looked around, no one was fazed. There were humans pushing their shopping carts across the parking lot. They’d stop periodically to wave another bicycle through, yielding the right of way to yet another bovine bicyclist. Paul seemed to be the only one baffled by this sequence of events. He felt his forehead. Maybe it was the heat? Maybe he’d eaten a bad mushroom at dinner? Earlier that day, on a secret farm over on the far side of town, Bessie sidled up beside Calvin, tail wagging, and asked whether he’d found anymore of the good stuff, that special plant they’d found in the hidden garden behind their master’s shed. It was so good. It made them feel invincible, like they could do anything in the world. Tasted sort of funny with a strange aftertaste, but it was the best stuff they’d ever eaten. They’d become quite fond of it, even if it was in short supply. Paul sat down on the edge of the sidewalk, trying to make sense of this seemingly surreal world that he was now immersed in. He tried to piece things together logically with no luck. It’s probably just the heat. I just need something to cool me off. The pickles weren’t going to work, so he grabbed the half gallon of milk, opened the lid, and took a few more good swigs. That’s better, thought Paul, as he wiped the white mustache from his lips. It was the heat. Everything seemed back to normal now as Paul waved the brown cow through the intersection before heading back home. I clutched the three dollar thumb drive in my pocket, knowing it was worth so much more. So much more. I fell into this fortuitous situation thanks to an overheard conversation. It didn’t matter that my inclusion was a return payment for my silence. It was worth it. I was inside the circle now. The CFO was as adept at manipulating information as he was people. His salary paled in comparison to the money being siphoned through the fictitious hedge fund. The return on these investments was usually risky. This one was a sure thing thanks to the aforementioned manipulation skills. I was the first one to arrive in the server room. Hidden behind the stack of CPUs that would make me my million were five USB sticks, one for each of us with instructions provided by the CFO. I snagged mine before sneaking back out the door. I was the last one added to the group, one more than they’d ever intended. I knew that I wasn’t benefiting as much as the other four, but it didn’t bother me. One million would be just fine. I quickly yet slyly proceeded to the coffee shop around the corner to inspect its contents. Everything was to be done on personal machines. No corporate connection could be inferred. The USB drives were risky enough, but still safer than email. I plugged in the USB stick and waited for the prompt. I typed in my password, M!lli0n5, and awaited my instructions. Invalid Password. Damn. How could I mess this up? I was sure that I had it right. I tried every variation with no luck. I stared at the drive sticking from my computer, trying to come up with other permutations, when I realized the problem. The block numbers etched on the stick. I read them upside down. I grabbed number two, not five. I should’ve just returned to the server room and retrieved the correct stick. My already mischievous behavior intrigued me. I looked at the password again. It spelled millions. Could it be? I typed another password at the prompt and was less than surprised when access was granted. M!lli0n2 was the password for stick two. The weak password had a suffix. The screen flashed before presenting me with instructions that I should’ve expected. Number five is a concern and needs to be dealt with. Buy 500 shares each. It’ll remove him from the equation. I may have been naïve, but not dumb. They were planning on choking my cut of the earnings while simultaneously adding it to each of their own. I was furious, but kept my emotions in check. Returning to the server room, I grabbed all five sticks. My role as IT lead was an oversight on their part. After reprogramming each of the drives with revised instructions, I replaced them in their original position. I knew now this would be my last week with the company. But, it would certainly be worth it, for many reasons. I loosened my tie and sank into the sports coupe. It was Friday afternoon, the end of yet another sixty-five hour week. Despite the chaos of rush hour traffic, I willingly accepted the unpleasantness knowing that a cold six-pack and the Knicks game waited for me at home. The chime interrupted the solitude inside the shell of my personal sanctuary. New text message from Kimmie. Speaking in the robotic voice that I came to loathe, Don’t forget to pick up the pizza for family game night – smiley face. Damn. I had forgotten that we moved family game night up by a day. And just like that, the chaotic traffic became an intolerable nuisance. As I slipped through the front door with the two pizza boxes, I was promptly greeted by my six year old daughter, Lisa. Although I was disappointed about the change in plans that I should have remembered, the excited look in Lisa’s eyes immediately lifted my spirits. “Hi Daddy,” she exclaimed while simultaneously jumping into my arms. I managed to balance the pizza in one arm and my little bundle of joy in the other. “It’s my turn tonight … to choose,” she said proudly. I didn’t need to ask. I knew exactly what she meant. At the front of her closet, in front of all the other toys and games sat Chutes and Ladders. We played it every other evening, but it held special significance when played on game night. It began as a silly dare and had now evolved into a family tradition. If Lisa won, she could stay up as late as she wanted. I always seemed to find more chutes than ladders. Tonight was no exception. On other nights, I might entertain the possibility of allowing Lisa to win. Not tonight. I was exhausted and ready to retire early. I was three spots away from victory and probably a little too eager to win against a six year old. My tenacious attitude in the boardroom was leaking over into my family life. Kimmie kicked me under the table. I pulled my feet back. Just tonight, I thought, let me win. Nope, somehow I knew it wouldn’t happen. I sank into the couch. My consolation prize was that I’d be able to catch the end of the basketball game. Flipping the television on, I was greeted by a blowout that wasn’t in my team’s favor. I flipped the power off and closed my eyes. Sometime around 2AM, the duo dressed in black sidled up to the curb around the corner. The lights inside surprised them. Inside the house filled with artificial light, Lisa remained curled up with her dad on the couch, peacefully sleeping – one dreaming of chutes, and the other of ladders. It appeared to be the most unfortunate sequence of events possible. In a moment of serendipity, however, I discovered what I had been aimlessly searching for in the emptiness of my world. I didn’t tell Amanda about my plans. It would be of little consequence whether I told her or not. I had to work late. It didn’t matter that it had nothing to do with what I had been sinking every waking moment of my life into for the past two weeks. I was on the brink of completing negotiations for the million dollar sale of a highly sought after loft on the Upper East Side. The bottom line is that I wouldn’t be home on time. That was all that was important. Amanda and Emma would be on their own for dinner. I knew that this was our weekly family time, and I did feel guilty about bowing out of my obligation as a husband and a father to my seven year old daughter again, but my hands were tied. I was the only one available. Phillip had an urgent situation arise at the last moment that needed immediate attention. It was something about his son and wife breaking down on the way to his holiday chorus recital. He dropped off everything I would need in my office before darting towards the elevator. I begrudgingly made my way to the bookstore around the corner from our office. I cursed this unexpected turn of events under my breath. I should have been etching seven digits into a ledger book in my quest for a successful real estate transaction, not reading about sugarplums and candy canes in this wretched getup. It was a way for our business to give back to the community. I had successfully avoided involvement for as long as possible, until now. I slipped on the pants, pulled the jacket over the top of my white oxford shirt and tie, and made sure to remove the white semi-curly locks from under the collar. I stuffed the down pillow under the oversized jacket before affixing the beard that scratched at the natural stubble I had accumulated over the course of a usual day. “Ho, ho, ho,” I uttered monotonously and sarcastically. “C’mon, Drew. Show a little holiday spirit. This is for the kids, after all.” The elf dressed in pointy shoes and a green felt costume was in a much more festive mood than me. I recognized her as an intern from the accounting department. With hot cocoa in their hands, the pack of children congregating in the back corner were waiting for Santa to begin reading the Christmas story. I could be more useful to kids, and Emma in particular, if I could ink that deal still sitting on my desk. This certainly wasn’t the ideal way for me to help provide for my family’s well-being. I put on a façade, enough of one at least, during the reading of the Christmas story. Now for the tough part. It was the children’s opportunity to come sit on Santa’s lap and express their deepest wishes for Christmas morning. The diminished distance between the children and me would make it infinitely more difficult to feign jolly tidings for the season. The line of twenty or so children seemed to continue on forever. After about forty-five minutes of the same requests – PlayStations, iPhones, puppy dogs, and Barbie dolls, everything changed. They frequented the small mom and pop pizza parlor too many times to count. It had become their stand-in whenever Drew was otherwise preoccupied helping to support their luxurious lifestyle. Amanda watched as Emma pulled the gooey cheese farther and farther away from her lips. Her arms weren’t long enough to prove victorious over the playful ploys of that extra cheese. She smiled, watching the innocence of youth, before reaching over and helping to put an end to the struggle between the young girl and pizza slice. “How about a chocolate chip cookie?” Amanda didn’t need to ask twice, and she didn’t need a verbal answer as Emma’s eyes opened wide and the smile spread across her face. Amanda knew that The Book Nook was known for their freshly baked cookies. It would be the perfect treat to take Emma’s mind off her dad’s absence yet again. After taking the first bite from her second gooey concoction in as many hours, Emma noticed the line of other children. Curious as always, she craned her neck and stood on tiptoes to get a better view. “Sure, honey,” Amanda replied as she wiped the excess chocolate that was left at the corner of Emma’s mouth. I couldn’t believe my eyes. What were they doing here? Amanda was focused on her coffee. I assumed it was her usual double mocha latte. The young boy presently sitting on my lap didn’t receive full attention as I tried my best to grab Amanda’s. Her eyes finally locked on mine. I could tell by her confused look that Amanda didn’t know why Santa was shaking his head while looking in her direction. She finally did recognize me as Emma began trotting towards the elf and hopping up to sit on my lap. It was a place that she hadn’t been for far too long. She seemed to be more comfortable on Santa’s lap than my own. “Ho, ho, ho!” I bellowed in as disguised a voice as I could muster. The smile on this little girl’s voice was so genuine. I hadn’t seen it in such a long time. No, I guess that’s not the right way to put it. I hadn’t recognized it, buried in my own self-absorbed pursuits. I already knew she wanted the new bike with training wheels we had looked at a few weeks ago. I also knew that she had several books lined up on her Santa list. She was an avid reader for a seven year old. It should have been easy for her to express the contents of her list to Santa. She had been talking about it nonstop. But still, Emma sat there on my lap with a perplexed look on her face, deep in thought about something. Uh oh, I didn’t like the direction this was going. “Santa always tries his best,” I replied. Okay, this was magic that I could certainly handle. “What would you like, sugarplum?” I became distracted by what might be forthcoming, probably the more expensive bike that was three price points above what Amanda and I agreed would be appropriate for her age. No matter, I’d find a way to make it happen. I always did. The imaginative seven year old, wise beyond her years, continued with her Christmas wish. Santa is supposed to be jolly. He isn’t one characterized by tears. This one came close to tears upon learning of this little girl’s Christmas wish. “Santa will do his very best.” It was the only response I could come up with in the moment. The look of elation and hope on Emma’s face as he hopped off my lap and bolted back towards Amanda was heartwarming. “Ho, ho, ho! Merry Christmas, Emma,” I shouted out to her. She stopped in her tracks and turned around. “Merry Christmas, Santa,” replied Emma with a look of wonder and amazement on her face. The last time I remember sitting on Santa’s lap was as a ten year old boy. I was convinced, however, that I had just been fortunate to visit with him once again in the form of a seven year old girl. Maybe Santa didn’t know everything, but this particular one knew more than enough now. Rachel watched as raindrops trickled down the pane of glass. The left one took a shortcut, veered to the right, and raced to the finish line at the bottom. These were the games of a bored six year old. The temperature had spiked unexpectedly. The pristine blanket of snow that began falling on Christmas Eve was being slowly eroded by gloomy showers in the area. When the rain subsided to barely a drizzle, Rachel’s begging to play outside was met with little resistance. She imagined herself as a frog, hopping between puddles, towards the safety of the next lily pad in search of prince charming. She always found the silver lining in everything. Everyone else saw the rain as a nuisance. Rachel playfully bounced through it. When she came to that coveted spot in the front yard, her cheerful smile transformed into an anxious furrow on her brow. On the ground, in the same mound that she remembered depositing it a few nights ago, was the oatmeal. Rachel remembered Grandma telling her the reindeer liked it that way. It was easier to eat when it was in a pile. She scooped up the soggy flakes and scampered into the house. “Mommy!” She screamed with dismay. “What is it dear, what’s wrong?” Her panic subsided as she saw her daughter’s hands. “Mommy, the reindeer must be sick. They didn’t eat anything at all.” Rachel held out her hand as pieces began to slip through her fingertips and fall to the floor. Grandma also said that oatmeal had magic powers that only reindeer could extract. In the right amounts, those oats would give them sustenance to last the entire time between their annual December journey. Rachel’s mom pulled down the box of oats. Rachel retrieved the measuring cup. One quarter cup for each reindeer. An extra quarter cup for Cupid because he was Rachel’s favorite. They wrapped it up, and addressed it to the North Pole. “Hurry mommy, he’s here!” Rachel ran outside. The mailman grimaced as the pestering rain dripped from the brim of his cap. “Reserve oats. For the reindeer,” Rachel’s mom offered with a grin. Upon inspecting the recipient’s address, the mailman promptly pulled the stamp from his pocket and branded the package with the words ‘First Class’. A proud smile appeared on Rachel’s face. The two adults in Rachel’s presence couldn’t help but smile too. The drizzling rain caused both of them to blink. She found it odd that they blinked with only one eye, but Rachel was just happy to help those reindeer when they needed it most. Little did Rachel know that she was helping those adults even more.